Happy Friday, friends! 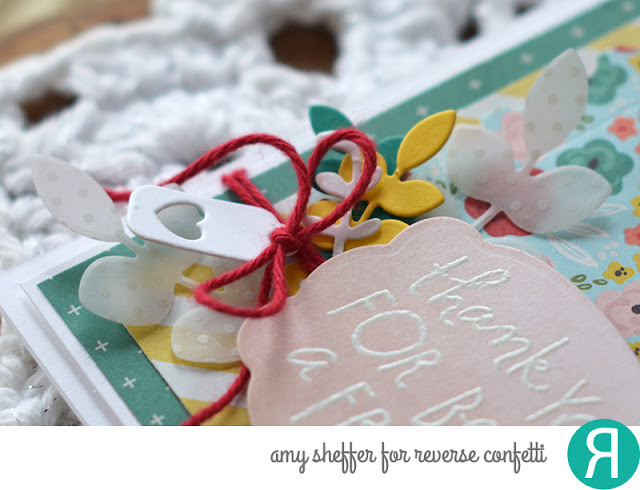 It's my day to tackle Reverse Confetti's February Sketch For You To Try. It's a fun sketch, with lots of possibilities, so if you haven't yet given it a go, I encourage you to do so! 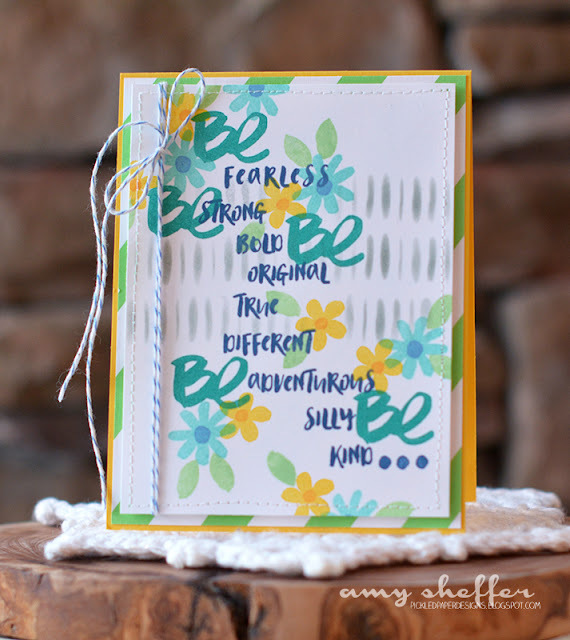 Challenge link-up and all the sketch details are posted HERE. 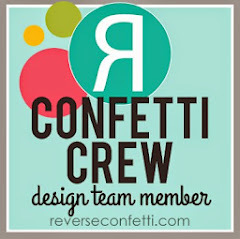 A $20 Reverse Confetti gift certificate goes to one lucky winner! I started today's card with a white Woodgrain Confetti Cuts panel and the Heart 12 x 12 Collection Kit by Simple Stories. The letters that spell out "LOVE" are stickers in the kit, as are the small solid hearts, flowers, and stars. Behind the top of the Woodgrain panel, I attached a skinny tag (die-cut with In the Bag dies) and a partial Swirlies die-cut. In the middle is an outline heart that I die-cut with the Stamped Note Confetti Cuts dies. It is accented with stickers from the Simple Stories kit. And at the bottom is a stamped sentiment, white embossed on vellum, from the Lovey Word Coordinates stamp set. Thanks so much for stopping by! 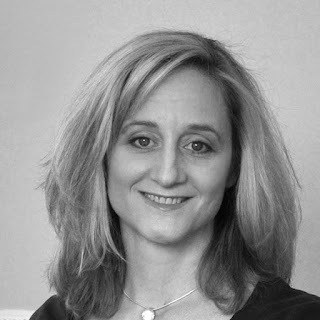 Be sure to visit Laurie Schmidlin today as well, to see what she did with this same sketch! Hello, hello, and Happy Wednesday! 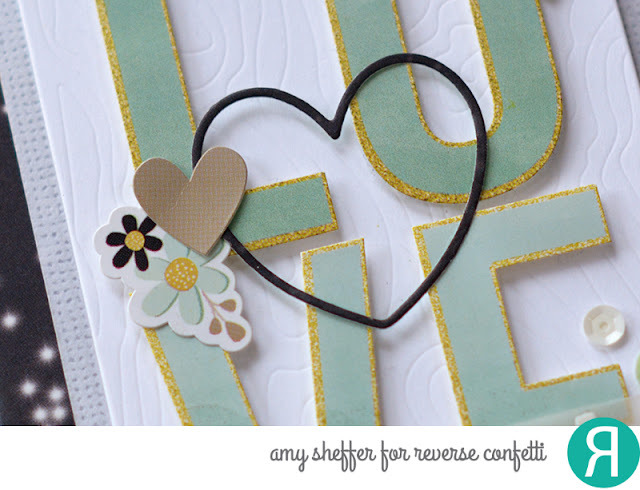 Please join me today on the Reverse Confetti blog for this week's Wednesday in the Works. Hint, hint, I'm calling this week "Wednesday in the [What If Nothing] Works." Yep, I'll be talking about a common ailment: no mojo. And one thing you can try! 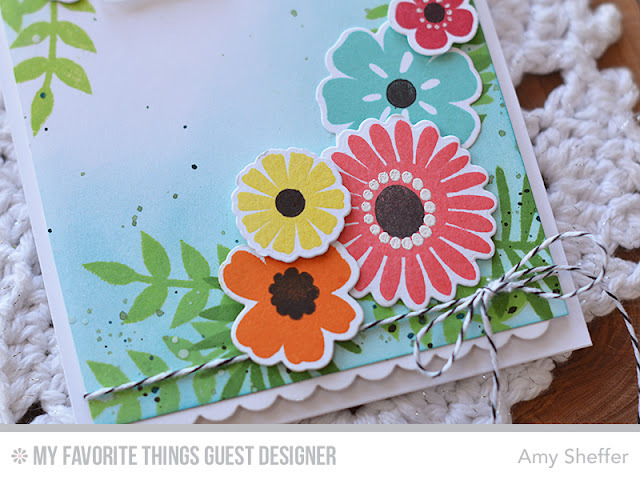 I'm up on the My Favorite Things blog again today. Thank you, MFT, for having me as your guest! Mid-February is an ideal time to fall in love all over again with florals, and the new Large Desert Bouquet from My Favorite Things is a perfect way to coax spring out of hiding. Today, I've played with some ink blending, stamping, and splattering to create some lush background greenery for my bright blooms. 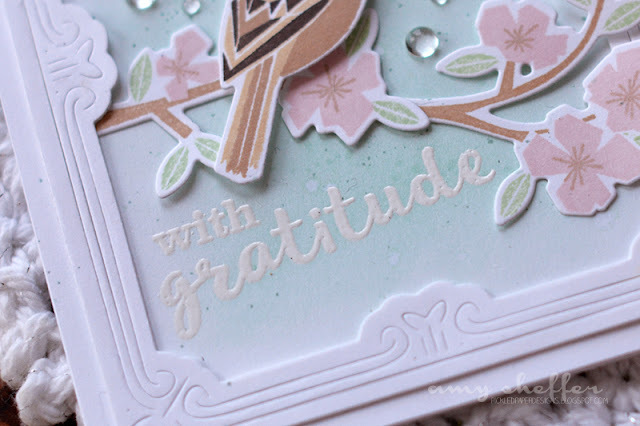 First I stamped the leaves randomly in two corner clusters, then sponged on some light blue and turquoise inks, fading to white toward the top. Last, I splattered with green, teal, and white. I used Gansai Tambi watercolors and a paintbrush for the splatter. Because they are thicker paints, the splatter spots hold their color well, especially for the darker colors. You can mix your own colors and control the intensity depending on how much water you add, too. 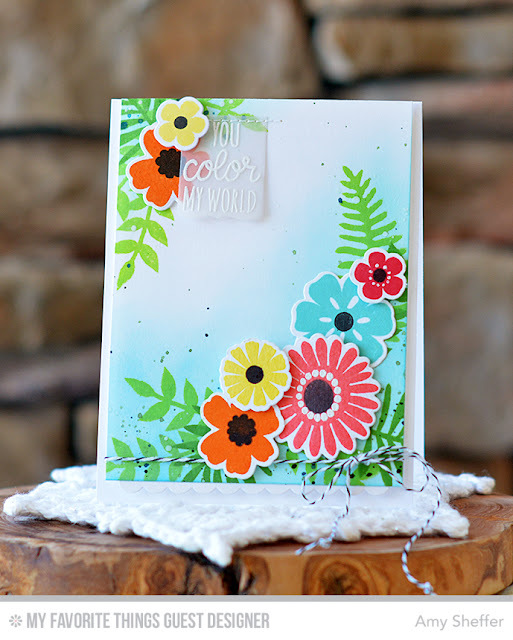 Next I stamped and die-cut a flower assortment in some pretty, bright colors and arranged them over the corner leaf clusters. Along the bottom is a petite scalloped border and some black and white baker's twine. The sentiment is white embossed on vellum and stitched into place. 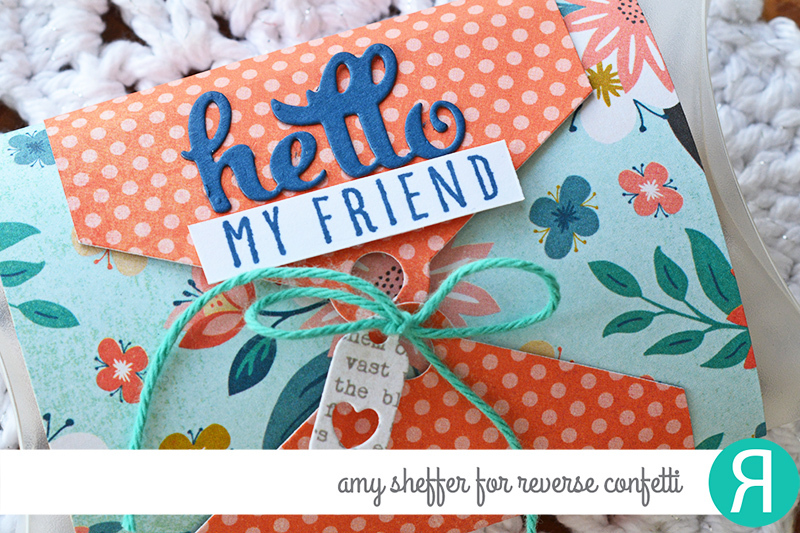 I have a few more projects to share today using Reverse Confetti's awesome February release. First up is a card that features a background that I stamped using the layered flowers in Garden Bunch along with a sentiment from The Lord's Strength. I framed the sentiment with an Envie Wrap Confetti Cuts die-cut and accented with enamel hearts, Caribbean Solid Twine, and a strip of diagonal stripe paper. 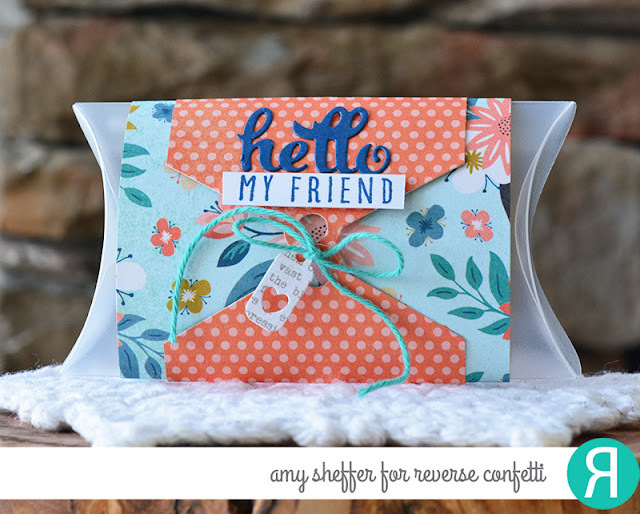 And next is a quick pillow box featuring A Friend Like You stamps and one of the Edgers dies. I wrapped the box first in one of the patterned papers from Basic Grey's Typeset collection (the floral). Next I cut a narrower piece of the contrasting orange polka dot (also from Typeset) and used one of the Edgers dies on each end. I wrapped that around the box and tied off with some Caribbean Solid Twine and a darling miniature tag from the Floral Wrap Confetti Cuts die set. The sentiment is a combination of the "hello" die-cut from Fancy Words and a stamped sentiment from A Friend Like You. 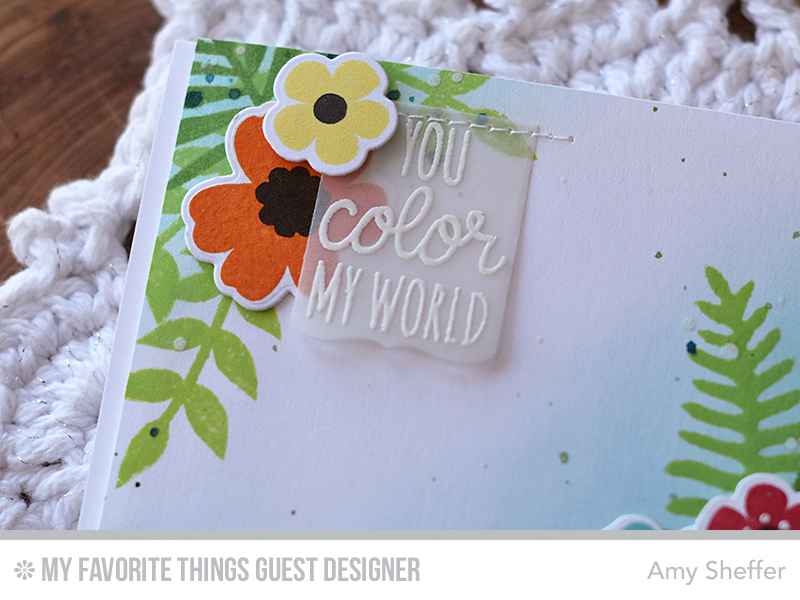 I'm super excited to be guest designing for My Favorite Things! 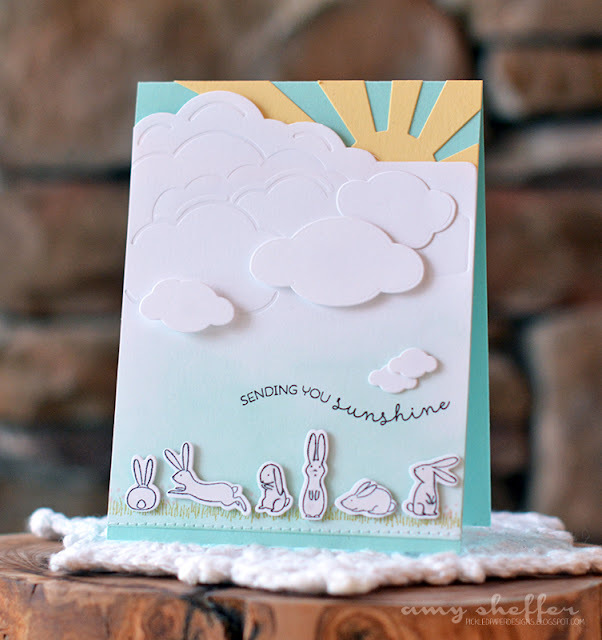 You'll find me on the MFT blog today and tomorrow. I've got a couple of goodies whipped up using their fabulous February release. 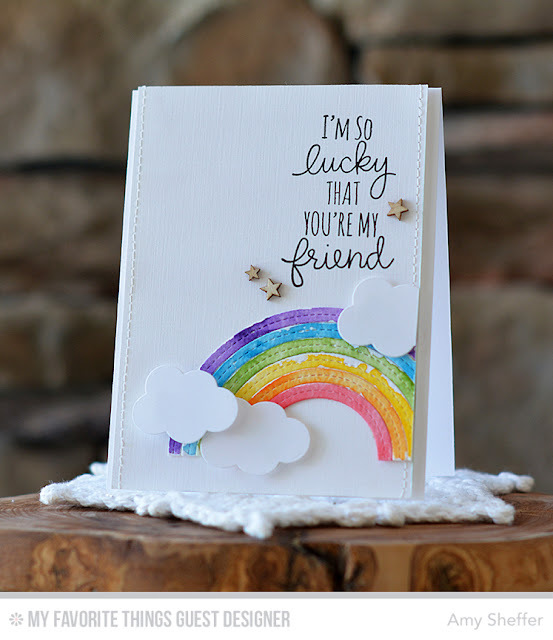 For today, I have a sweet and simple friendship card using the Stitched Rainbow Die-namics along with the Lucky stamps and Lucky Die-namics dies. 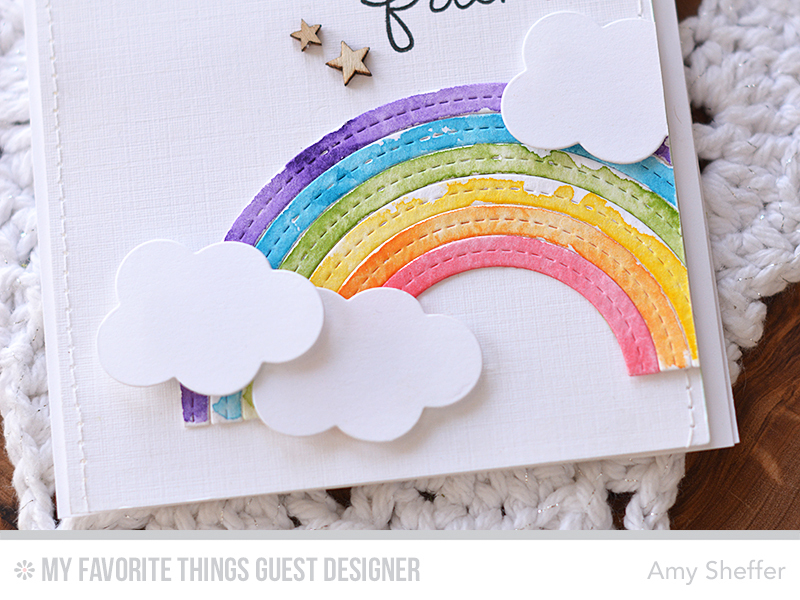 I love making cards with rainbows! I find with all of that color, it makes sense to keep the rest of the card simple, so rainbows can be an especially good option for quick cards and multiples. I die-cut the Stitched Rainbow from watercolor paper and did some loose watercoloring in rainbow colors. 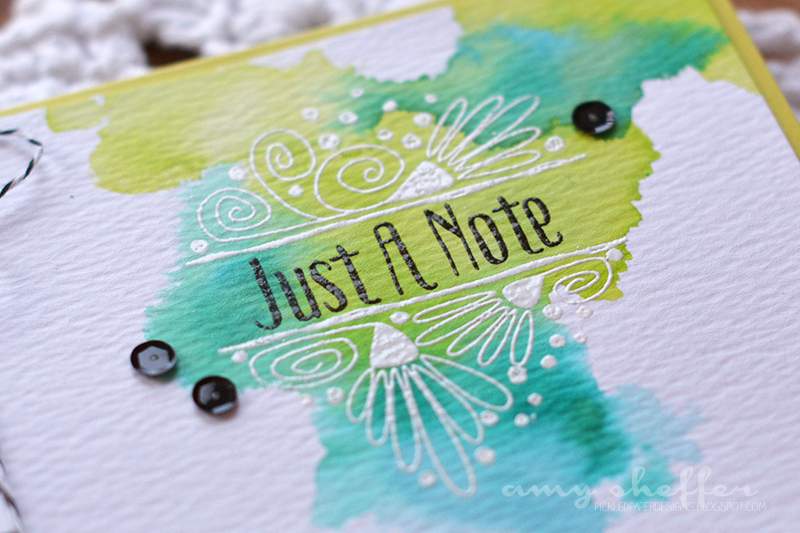 I love the whimsical look of the watercoloring. I offset the assembled rainbow on a white card stock panel, popped up some cloud die-cuts from the Lucky Die-namics set, then trimmed off the overhang before layering onto a white, top-fold card base. I love the sentiments in Lucky and am having serious font envy. As in, I totally want my handwriting to look JUST like that! Isn't it just so fun and charming?! 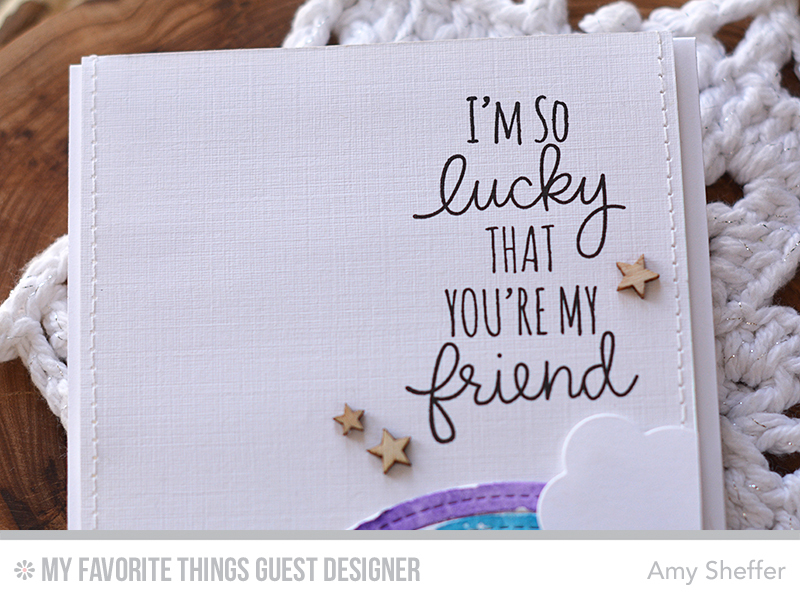 I stamped the friendship sentiment in black ink onto the white card panel for a nice, crisp look. With clean and simple cards, often the appeal is in the small details. 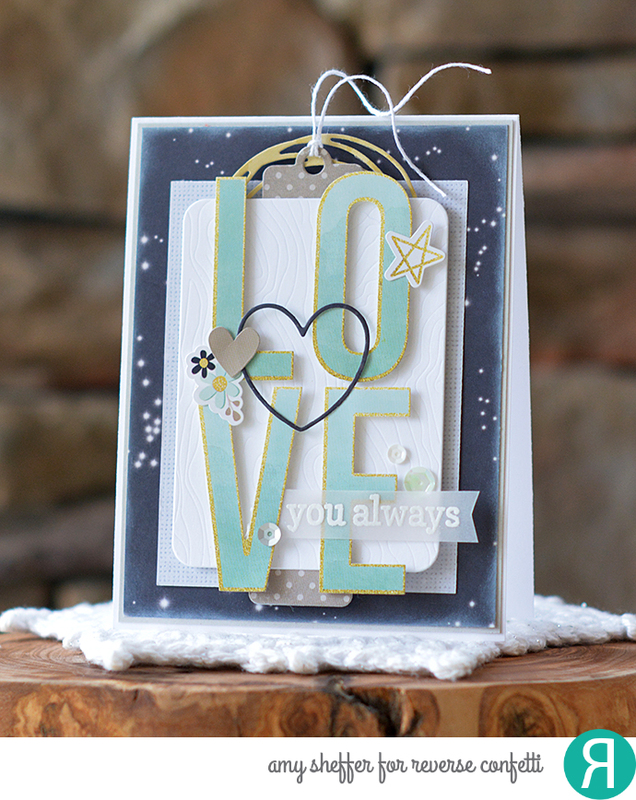 Here, I've added a few wood veneer stars around the sentiment. The machine-stitched borders are another subtle detail that packs a whole lot of punch. 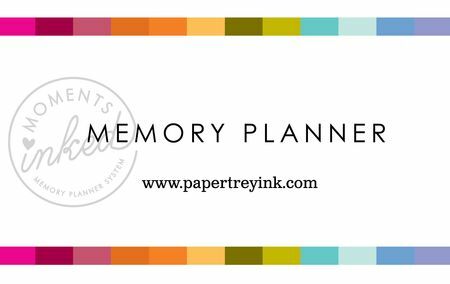 Papertrey's big February anniversary release is nearly here. 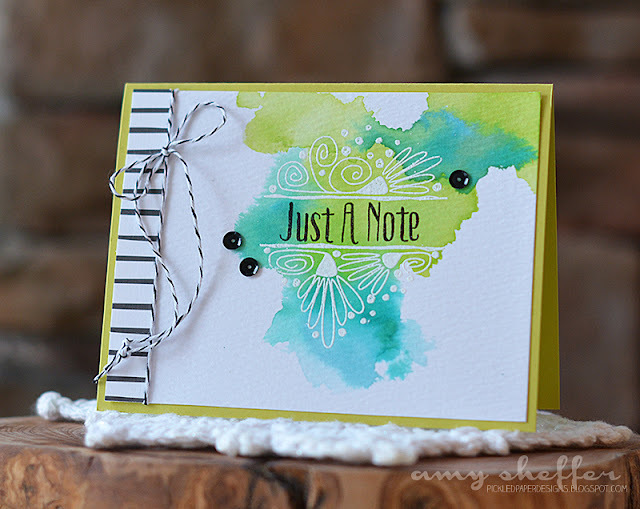 All of the products will be available in the Papertrey Ink store tonight at 10 pm EST! I have a number of additional projects to share today -- enjoy! First up is Betsy's What the Doodle: Butterfly. 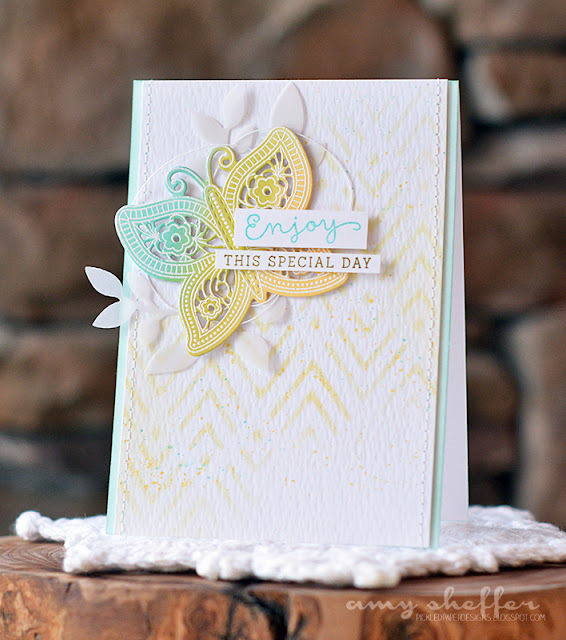 I heat embossed in white, then sponged in yellow, green and turquoise inks. The background was done with one of the new Modern Backgrounds stencils. 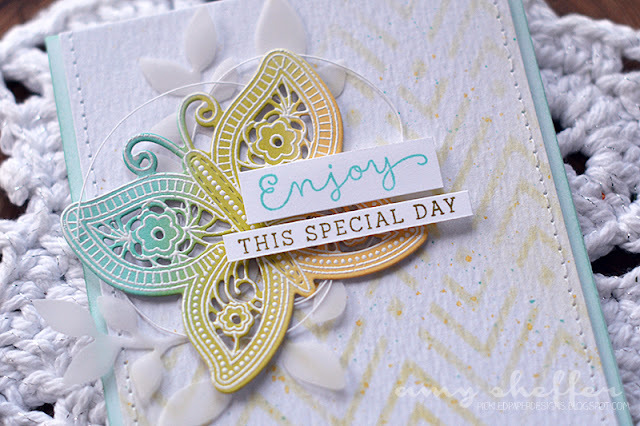 Behind the butterfly is a vellum Branching Out die-cut. I love Heather's Be stamps and dies! I put a bunch of those motivational words together in a list and made a bookmark. And I did the same thing on a card to match. No photo, but on the inside there is one final "Be Yourself." I had my middle school-age daughter and all of her friends in mind when I made this. Such a tough age! 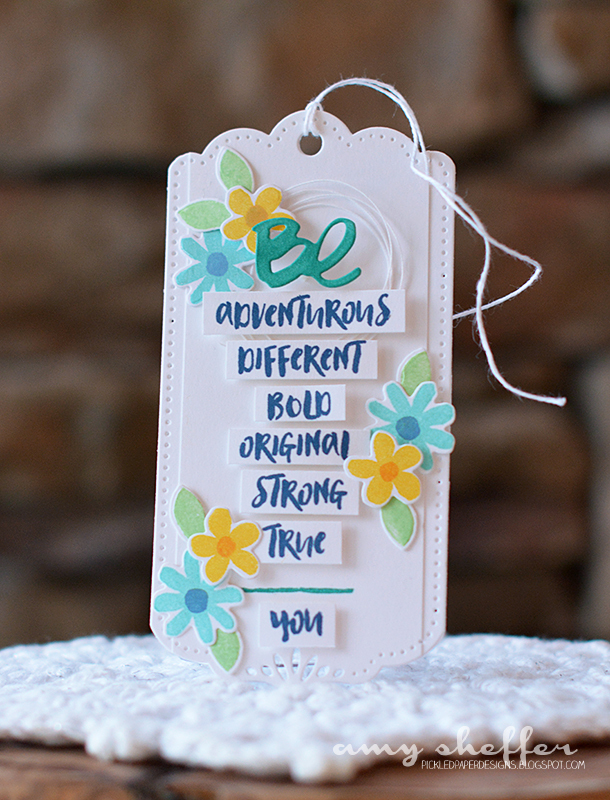 The reminder to be yourself and that you already are all of those other things really strikes a chord! 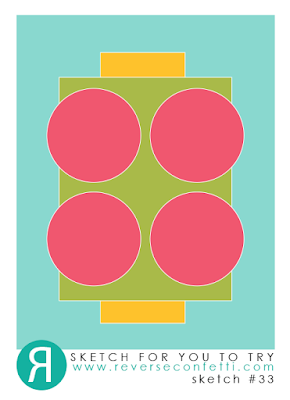 I'm really enjoying the new Modern Backgrounds stencils. Here I've used one to add interest to the background. 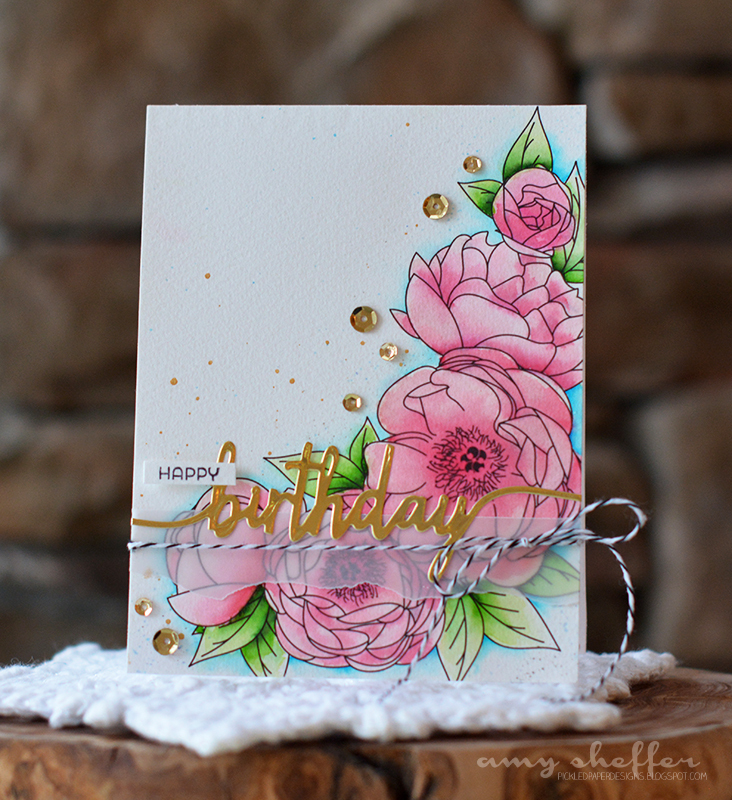 Raise your hand if you love Dawn's Peonies on Parade collection! Here I've used one of the Peonies on Parade watercoloring pages and colored with Zig markers. I added some gold splatter and gold sequins in the background. 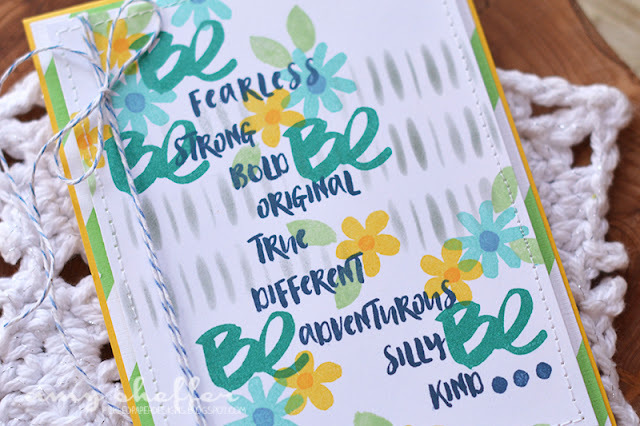 The sentiment is from the previously released Super Swoosh die set and Swoosh stamp set. 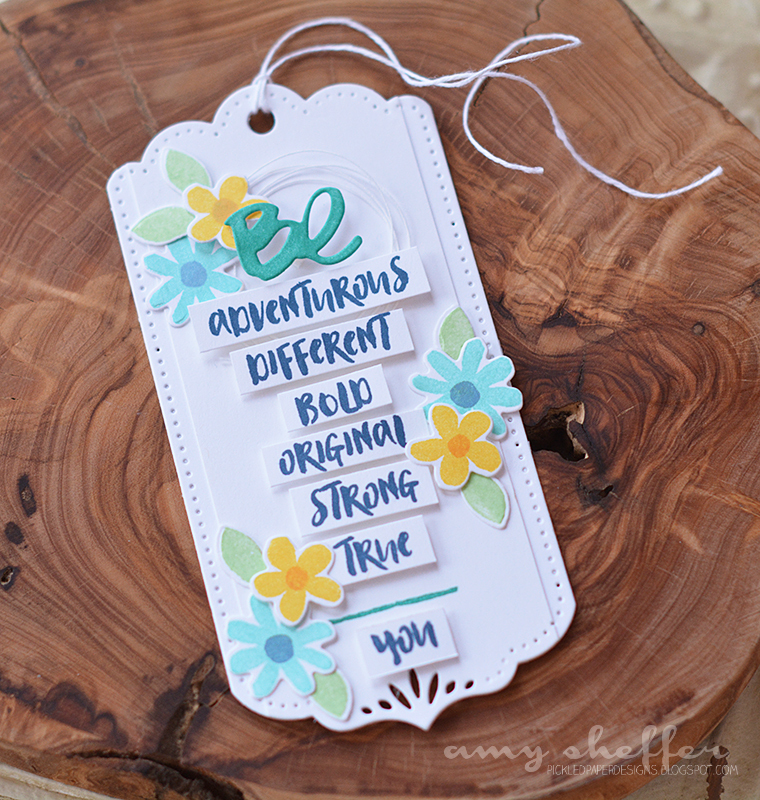 A touch of vellum helps the sentiment stand out. This one also uses Peonies on Parade, as well as Betsy's Inspired: Savior stamps and dies. I wanted to try something a little different here. 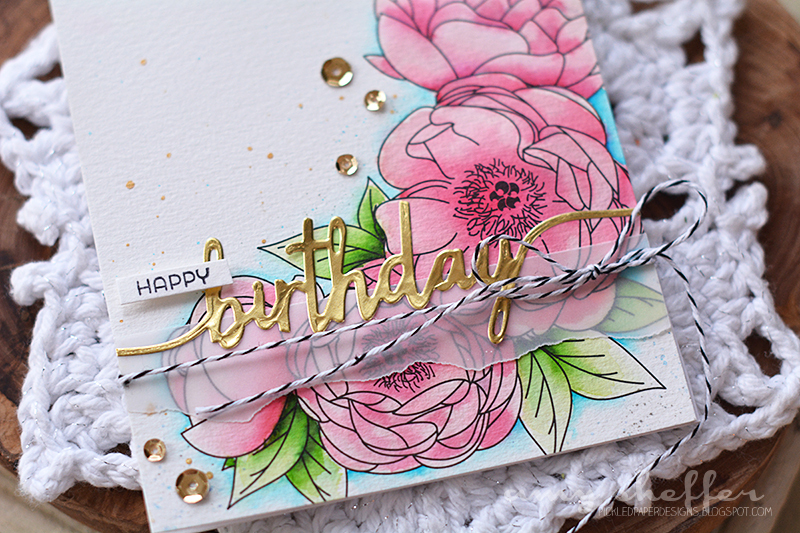 I heat embossed the peonies on Soft Stone Stripe paper and left them uncolored for more of a background effect. I love the look but it seems criminal to minimize those beautify peonies in any way! Again the sentiment is from Inspired: Savior. 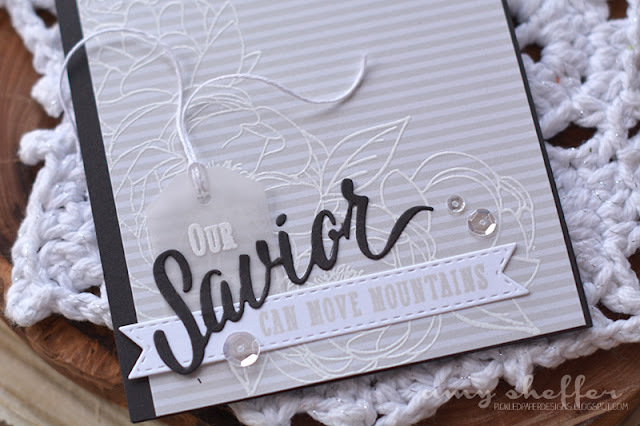 It's in three pieces: "our" is on a Keep It Simple Frames tag die-cut, "Savior" is die-cut from Smokey Shadow card stock, and "can move mountains" is stamped in Soft Stone ink onto a Tag Sale: Quilted die-cut. 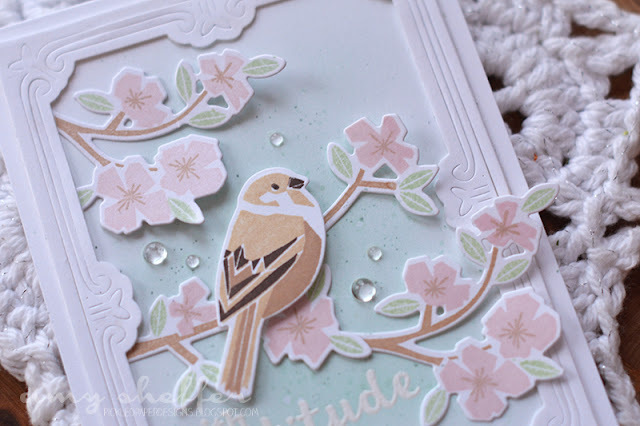 I used the Nichole's Spring Woods stamps and dies, along with Erin's Cover Plate: Pretty Frame to make a sweet thank-you card. I love these branches and the multi-step birds! The background is lightly sponged and misted. The sentiment was embossed in white and resisted the sponging around it. I love the subtle look of this. Next up: Maile's Splits: Just A Note. I heat embossed the image in white onto a watercolor panel I had in my stash - it fit perfectly! I kept it simple with just a strip of black and white stripe paper and a trio of sequins. Last for today is Lizzie's Simply Spring Borders. Oh my goodness, the cuteness and the charm! I love these bunnies to pieces!! I gave them a little scene to play in using the Cover Plate: Blue Skies and Cover Plate: Blue Skies Rays. 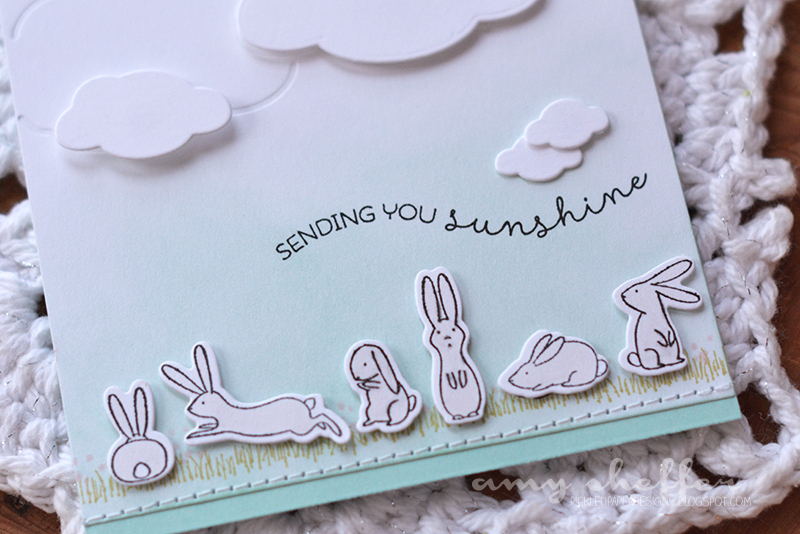 Along the bottom, the bunnies were stamped twice - once on the card (really for placement purposes), then again on separate card stock, die-cut, and popped up over the first bunnies. I ever-so-lightly colored the bunnies with a very light gray Copic. Before stamping the bunnies, I sponged on an Aqua Mist sky, stamped the grass and some tiny pink flowers, and added the line of machine stitching. Papertrey's big February Anniversary release is tonight at 10 pm EST! If you're looking for my Release in Review post, click HERE. This post is for the Papertrey Ink Moments Inked Newsletter. 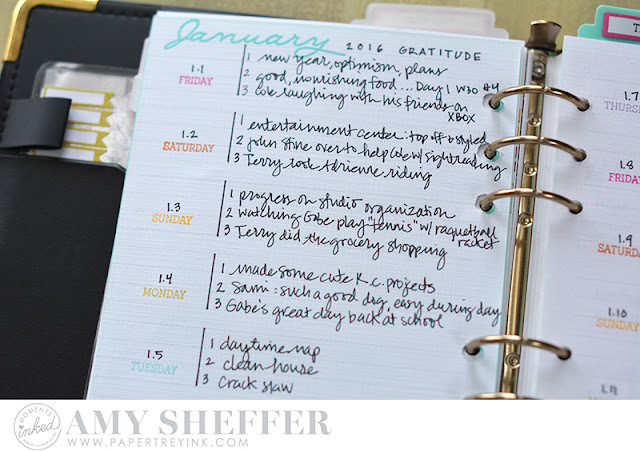 I'm excited to share with you how I've created a simple Year of Gratitude journal within my planner. For a section divider, I cut a full page out of a plastic office supply store file folder using one of the Binder Page dies. On the front, I've printed out one of my favorite gratitude quotes and adhered it to the divider. 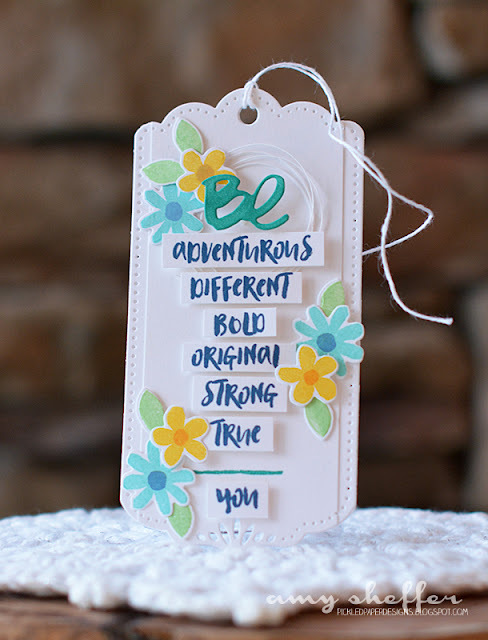 I have grand ideas of hand lettering this quote and decorating with stamps, and I'll be sure to share here if/when I do that! 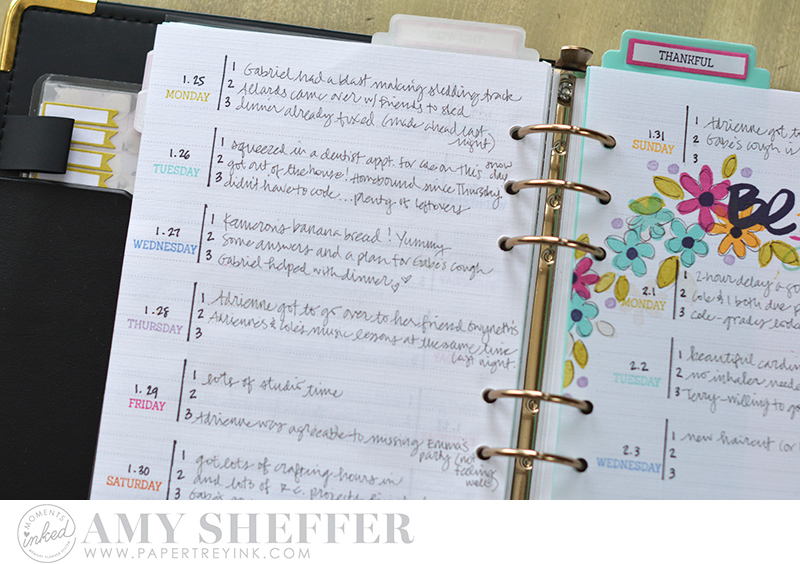 On the pages, I've used a simple bullet-journal approach made colorful with stamps and ink. 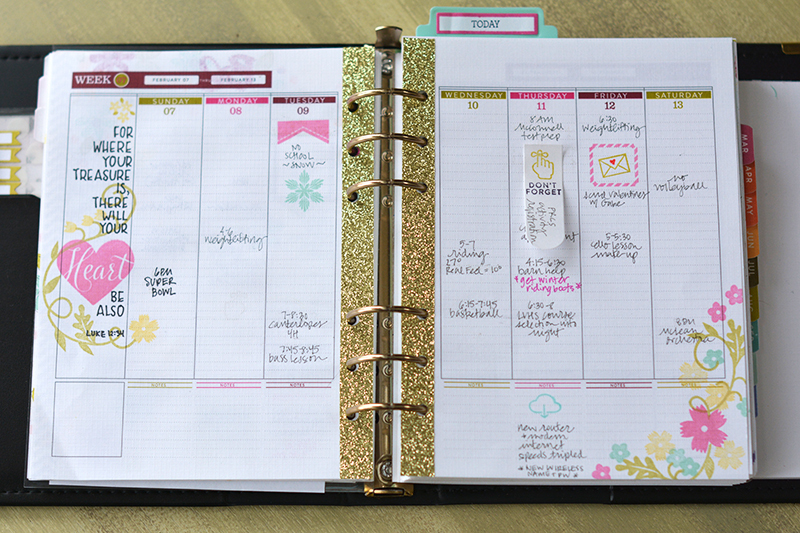 Each day is stamped with the day of the week stamp from Monthly Moments: Tabbed. Then I just used a ruler and fine-point Sharpie for the vertical line, wrote in the date, and wrote in the 1, 2, and 3. For the pages, I'm using the new Lined Paper Packs. 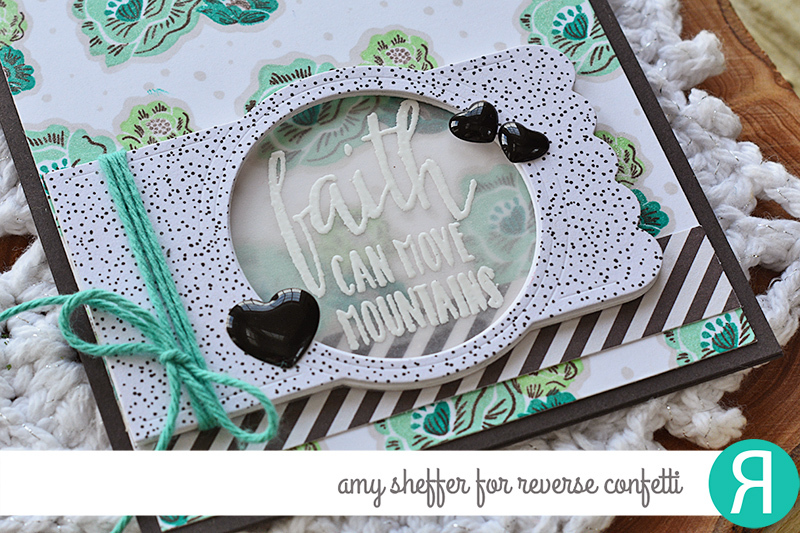 I'm so crazy excited for these refills and for the graphed paper refills, both available tonight. They're on the same weight linen paper as the rest of the planner, and they have that signature rainbow stripe along the bottom, which match the rest of the planner's notes pages perfectly! At the beginning of each month, I'll do a little decorating and embellishing. The stamps are all from Heather's new Be stamp set. I didn't do much in January because it was only going to be temporary. I do like this simpler, cleaner look, though! 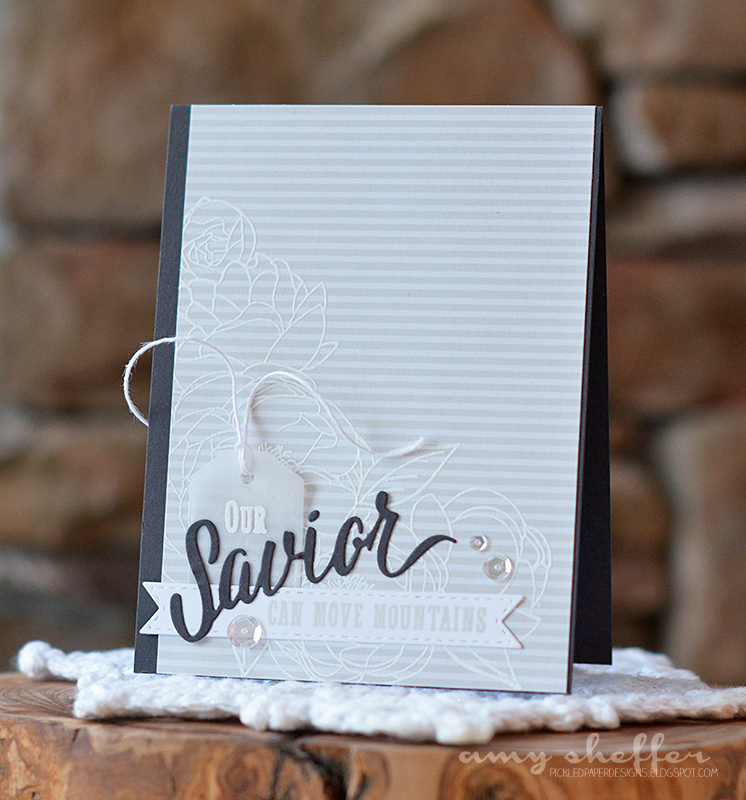 The month image is from Monthly Moments: Year Round Minis. Because these pages will accumulate over the year, I made a page marker using the Binder: Listed die to help me quickly find my place. At the top, I stamped "thankful" from Monthly Moments: Tabbed. 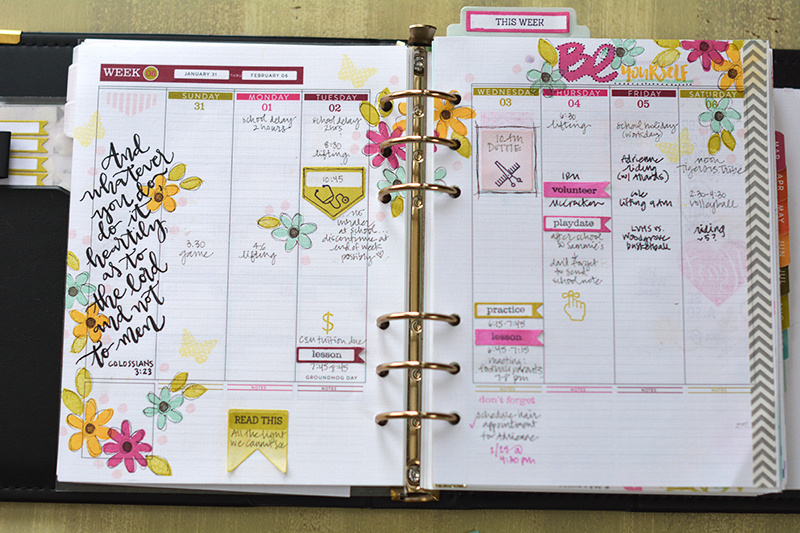 And before I go, just because I always enjoy seeing other people's planner spreads, I'll share a few of my recent ones. I showed bits on Saturday's post introducing the new products this month, but here are the full pages and the Bible verse lettering. 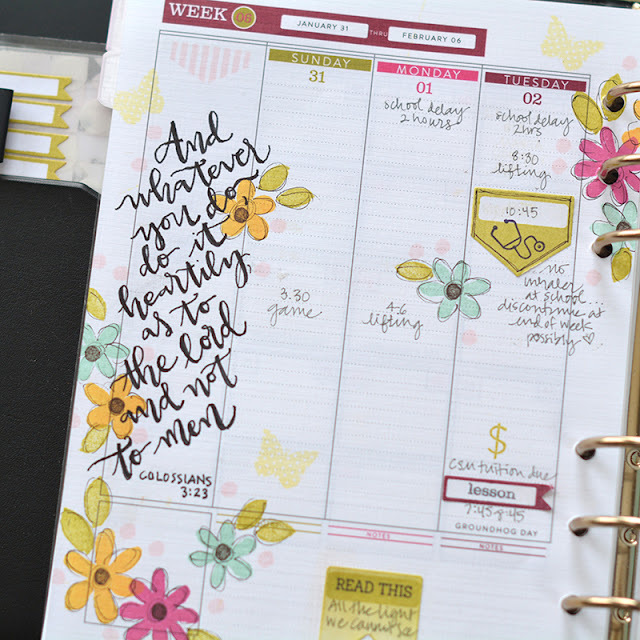 Last year, I was definitely minimalist, and rarely decorated until I started the Bible verse lettering. This year, so far, I'm adding a lot more stamping, stickers, washi tape, etc. The flowers (again) are from Heather's Be, coming out tonight. I also used a lot of the new Everyday Symbols. Also appearing are images from the Clipsters Make It Market Mini Kit. 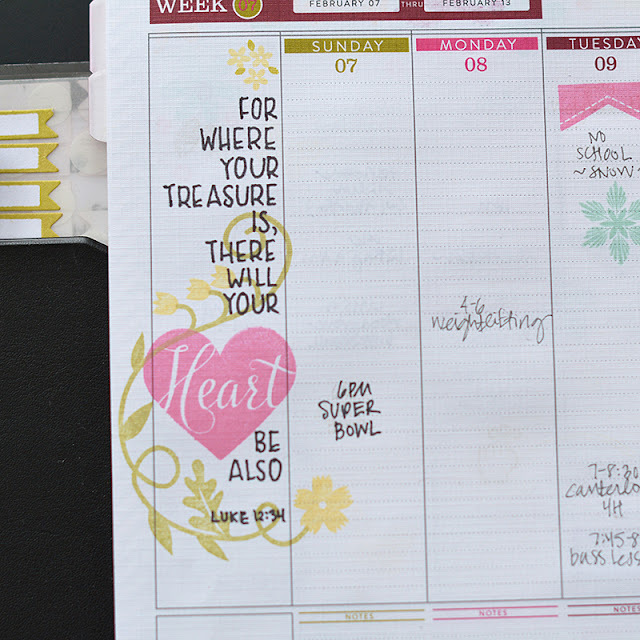 The verse of the week is hand-lettered and decorated with Be and Clipsters. The Heart stamp is from Phrases & Praises. The vine and flowers are from the new Paper Clippings: Happy Day stamp set. The rest is hand-lettered with a black fine-point Sharpie. That's it for me! So glad you stopped by. Happy Monday!